Washington, D.C., circa 1906. "Senator George P. Wetmore, Rhode Island." 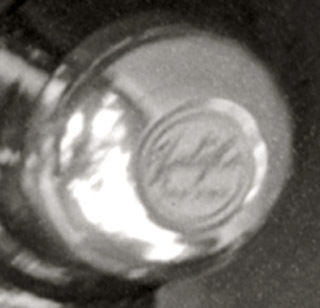 Who can identify the car? (The current consensus: Krieger electric landaulet, from France.) Harris & Ewing Collection glass negative. View full size. Submitted by don munro on Thu, 03/26/2009 - 6:48pm. Amazing! 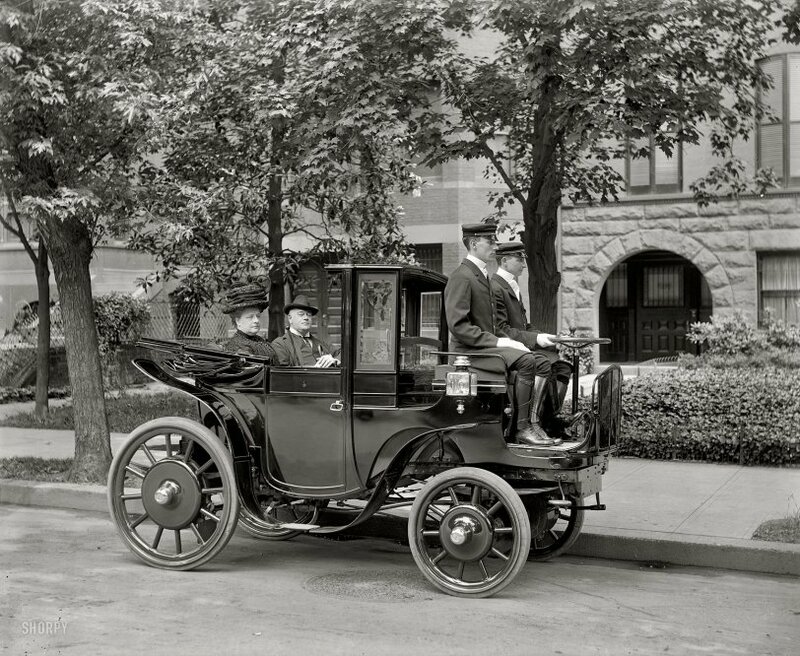 An electric car in 1903, and here we are 106 years later still trying to get people to use them. Submitted by Erzsi on Wed, 03/18/2009 - 9:11am. Funny how they retained the cavalry-style puttees and breeches on the footman in the absence of horses, just because that was supposed to be the most elegant style of servant. The footman who, incidentally, resembles Ian Thorpe. Submitted by Figbash on Tue, 03/17/2009 - 1:59pm. One chauffeur to drive the carriage and a second to open the door? Washington snobbery at its finest. At least it's not a G5. Submitted by Anonymous Tipster on Mon, 03/16/2009 - 11:01pm. Louis Antoine Krieger (1868-1951), who began making horseless carriages in 1890s Paris, designed his own drive motors with a second set of parallel windings for regenerative braking. These were mostly large heavy Broughams used as cabs. 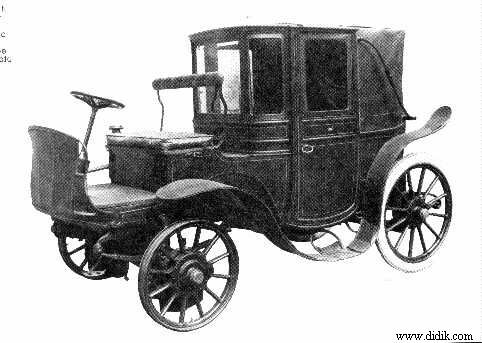 The first Krieger was a fwd conversion of a horse-cab, with a separate electric motor in each front wheel. The Krieger-Brasier of 1903-1906 was a gas-electric car. Submitted by Foy on Mon, 03/16/2009 - 9:55pm. Whatever it is, that is a seriously phat ride. Submitted by Anonymous Tipster on Mon, 03/16/2009 - 9:45pm. Paved road, concrete curbs, nice sidewalks and what looks like a manhole cover under one of the front wheels. Is it possible the photo was taken some years later? Did the roads look that smooth and cared for in Washington in 1906? Submitted by treplovski on Mon, 03/16/2009 - 9:01pm. It reminds me of a children's book, "The Day It Rained Pancakes." Submitted by Anonymous Arkie on Mon, 03/16/2009 - 3:47pm. Submitted by Ray Downing on Mon, 03/16/2009 - 2:35pm. Mrs. Wetmore is identified as Edith in the 1900 census. She and George, a D.C. lawyer, live at 1609 K street. He was born in England, she, New York. Two daughters and two sons share the home. Her hat is the norm for 1906, really. Submitted by Anonymous Tipster on Mon, 03/16/2009 - 1:50pm. Mrs. Wetmore's hat looks like an early walking advertisement for IHOP; chocolate pancakes with powdered sugar. Submitted by Brent on Mon, 03/16/2009 - 1:15pm. While I realise that the comment guidelines frown on "correcting" other posters, I can't help but wanting to contradict "Lonestar Yankee's" statement that Senator Wetmore was "acting like royalty on our dime." Without going into too much detail, it is clear that Senator George Peabody Wetmore was a wealthy man before becoming the Governor of Rhode Island or the state's Senator. His father William Wetmore made a huge amount in the China trade and as an associate of investment banker George Peabody. In other words, if the Senator wanted that car with a chauffeur and footman, he could afford it whether he was in public life or not. Submitted by Anonymous Hubster on Mon, 03/16/2009 - 12:49pm. Can you please zoom in on one of the hubcaps? Submitted by Susan811 on Mon, 03/16/2009 - 12:28pm. I guess the two drivers are out of luck. Submitted by stanton_square on Mon, 03/16/2009 - 12:57pm. While Krieger may have manufactured hybrid-electric vehicles, it appears that this is not one. Where would the petrol engine be placed? The main battery is under the driver's seat with an additional battery under the passenger seat. This vehicle does, however, have one "modern feature:" regenerative braking! I suspect this might have indeed been Sen. Wetmore's private vehicle. He is mentioned in a newspaper article as being one of the earliest adopters of horseless carriages in the district. The special feature of this carriage is the driving of the front wheels each by an independent motor. The carriages may be readily recognised in the London streets by the large diameter of the rear wheels; in this case, as they are not driving wheels, the advantages obtained by the use of wheels of large diameter can be secured without unduly increasing the cost of tyre upkeep. The front wheels are carried on the Ackermann joints, and the motors drive the wheels through spur gearing ; the motors are mounted in such a manner that they are free to revolve a short distance either way around the large spur wheel, the movement being taken up by springs. This particular method of suspension is of course essential where spur gearing is used, to protect the motor from sudden shock and to give flexibility in starting. The method of carrying the battery may be described as somewhat old-fashioned; it is divided into two parts, both carried on the upper side of the frame in such a manner that provision must be made for its housing in the body. Owing to the front-wheel drive, the steel frame receives a somewhat awkward bend, which raises the driver's seat to a high level. The steering is accomplished by the use of a tiller handle, to which reference has been made elsewhere ; the rod through which the movement of this handle is transmitted to the steering gear is vertical and passes through the centre of a substantial hollow column, which contains the controller. The various speeds on the controller are obtained by moving a handle placed under the steering handle, and moving in the same plane. The only mechanical brakes are attached to the rear wheels, and are worked by a single pedal. Special provision is made for charging the battery while descending a hill; the controller gives one electric brake and one reverse speed, also a neutral position—which is likewise the battery-charging position—and eight positions forward, position (1) being for starting; (2) for slow speed forward ; (3) for recuperation at 40 volts ; (4) and (5) normal speeds on the level; (6) recuperation at 80 volts; and (7) and (8) extra high speeds and for recuperation at normal speeds, giving a low charge to the battery. These carriages are of smart appearance and noticeable for quiet running; it should be mentioned that the pinions on the motors are made of fibre, so that the spur gearing is practically silent. Submitted by Anonymous on Mon, 03/16/2009 - 10:51am. If anyone looks smug in this photo, it's the good Senator Wetmore. He probably picked out his wife's hat, and the car probably is a rental! Submitted by Lone Star Yankee on Mon, 03/16/2009 - 10:40am. Politicians were acting like royalty on our dime. Except now, the emperor has no clothes. Submitted by Vic on Mon, 03/16/2009 - 9:20am. Love the detailed window work, and the raisable/lowerable front window for either fresh air or protection from the cold. Just marvelous. Oh, and I think his wife looks wonderful. Submitted by Anonymous Arkier on Mon, 03/16/2009 - 8:56am. This vehicle is a good example of the period when automobile design was changing from 'horseless carriages' to true automobile design. You could put four horses in front of this beast and it would look just right. Transition indeed. Submitted by Anonymous Tipster on Mon, 03/16/2009 - 7:28am. If one driver ever goes flat, at least they've got a spare. Submitted by Norm Corliss on Mon, 03/16/2009 - 6:53am. Mo dash, no windshield, no seatbelts - put the brakes on a bit too hard when your passenger wasn't forewarned and he could tumble right off the front and be run over by his own car. Submitted by rick557 on Mon, 03/16/2009 - 6:07am. What IS that on her head? Submitted by Baldy Cotton on Mon, 03/16/2009 - 5:42am. Would someone please be so kind as to inform the good Senator's wife that her hat makes her look like an idiot? She just looks so so so smug in her excess wealth. I'm pretty sure no one would dare tell her how absurd she looks. Submitted by Masque on Mon, 03/16/2009 - 5:05am. The only thing polished brighter than the auto is the boots on those young men. Submitted by stirwool on Mon, 03/16/2009 - 4:01am. Looks like a Krieger Electric. This 1903 Krieger proves that there is nothing new under the sun. This car is a front wheel drive electric-gasoline hybrid car and has power steering. A gasoline engine supplements the battery pack.